This interesting surname has a number of possible origins. Firstly, it may be of English locational origin from one of the places thus called, for example in Cheshire, Somerset, and the East Riding of Yorkshire. The placenames are recorded respectively as "Hulle" in the "Inquisitiones Post Mortem" (1283), as "Hilla" in the Domesday Book of 1086, and as "Hul" in the Early Yorkshire Charters (1156). The derivation is from the Olde English pre 7th Century "hyll" meaning hill, it may also be a topographical name for a "dweller on or by a hill". The sound represented by the Olde English "y" developed in various ways in the different dialects of Middle English and in the west and central Midlands it became a "u", thus the spelling "hull" evolved. One John ate Hulle, is noted in the "Ministers Accounts of the Earldom of Cornwall", (1297). 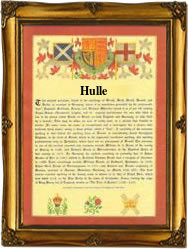 Finally, the surname may derive from the personal name "Hulle", a pet form of "Hugh". Hulle le Bule, appears in the Pipe Rolls of Staffordshire (1201) and Henry Hull, is noted in the Court Rolls of the Manor of Wakefield, Yorkshire (1309). One Katherin Hull, aged 23 yrs., departed from the Port of London, aboard the "Hopewell" bound for Virginia in September 1635. The first recorded spelling of the family name is shown to be that of Peter de Hull which was dated 1199, witness in the "Assize Court Rolls of Staffordshire", during the reign of King John, known as "Lackland", 1199 - 1216. Surnames became necessary when governments introduced personal taxation. In England this was known as Poll Tax. Throughout the centuries, surnames in every country have continued to "develop" often leading to astonishing variants of the original spelling.